Gophers v. Badgers. Here. We. Go. We are going to use your Tweets, as they happen, to crowdsource this recap. The Gophers are on a disappointing 3 game losing streak. The Badgers are fresh off disappointing losses to Iowa and MSU. Both teams are desparate for a win. Should be a good one. Both teams are running completely inept offenses. Both run clock and then jack up a desperation three. 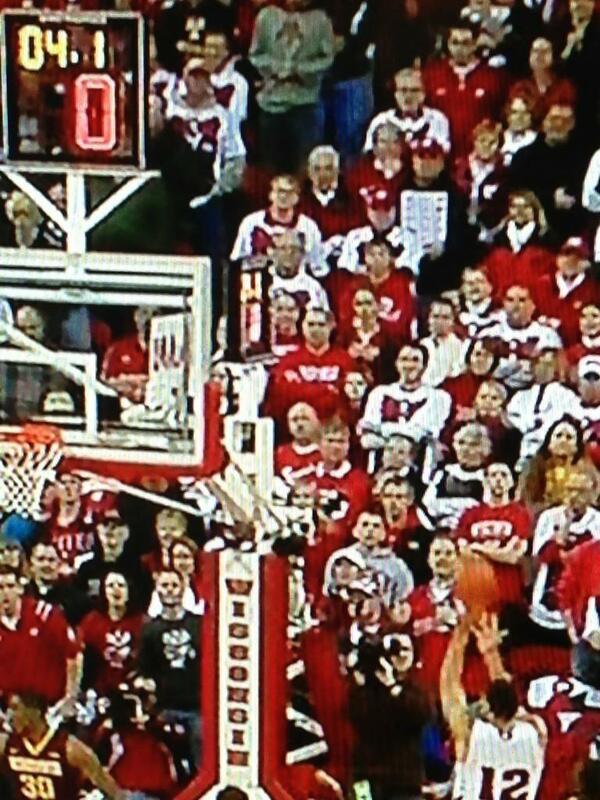 Big 10 Basketball ladies and gentlemen!! Amelia, you might be my favorite Strib ink-stained wretch, but this should not surprise you. Seriously. Maverick Ahmnisi comes off the bench and hits two big threes. But both teams are showing a serious lack of offense right now. Is Mbakwe afraid of Berggren?? That is the only explanation I have for him not making any plays. This same thing happened in the Northwestern game. Mbakwe dominated for stretches of that game, but he just disappeared when the Gophers needed him most. Could not agree more. Mbakwe finally realizes he has a day-walker (Brusewitz) on him and goes right at the rim. If the Gophers are going to win, they need to continue feeding the 6th year senior. The funny thing about Eliason is that he played really well in Mbakwe’s absence last year. He looks to be in good shape, maybe even a little bigger than last year. And yet, Tubby has him getting very few minutes. If he continues to play well off the bench, his minutes should increase. Yeah, let’s not go crazy. For a minute there, I thought PA might have kidnapped the BTN color guy. Could not have missaid it better myself! As always, Gophers fail to close out defensively at the three point line and Dekker makes them pay. Someone needs to be in that kid’s pocket for the rest of the day. I am having flashbacks to the Northwestern game. Skinny white boys knocking down threes have been this teams Achilles heel. Not hard to figure out the sentiment of the fans. And those are just the cleanest of the reactions we saw. Unfortunately, they are right. If the Gophers cannot figure out how to capitalize on its most talented team in nearly 15 years, there will need to be a change. I know the practices facilities are less than great. And our students have to pretend to go to classes in subzero weather, but those are really poor excuses. Nebraska has a world class practice facility and I do not see them making serious noise on the national stage. Come on Amelia!! Cannot be so negativ…never mind. Uh-oh, we are losing them. Hopefully the team has a little more confidence than the fans and beat writers. Stop me if you have heard this one before. Mbakwe is hustling to make plays on the offensive glass. He, quite literally, nearly broke his back. But all to no avail. Gophers trail by 2. Yeah, Mo has some talent, but he is about 35 pounds too big. He cannot move his feet quickly enough on defense. And he often times looks lost in terms of who he should be guarding. That said, he has shown flashes on the offensive end. I still think Eliason is the better sub for Tubby right now. He has been a spark for this team today. Well, Brandon, not sure we need to rub it in. I tend to agree. How is it possible that the Gophers are already in the penalty. They have not changed their style of play. Calling a lot of touch fouls, not Big 10 basketball. Dre hits a big three and puts the Gophers up 2. He has 18 on the day and simply cannot be guarded. The refs have ruined the rhythm and flow of this game (definitely plays to the Badgers strength – solid ball control and slow play), but Dre will not be denied. If he can tap into a little of the NIT magic he had late last year, the Gophers can win this game. Even if no one else on the team knows what to do on either end of the floor. Huge problems again finding guys on the perimeter for this Gophers team. Not a good flaw when facing a team like the Badgers who love the three pointer. What is sad, you could replace @TMbakwe32 with @Bergeron40 and this tweet could be a Badgers’ fan. Both teams are doing a tewible job running anything resembling an offense. Gophers cannot get the ball inside where they have an advantage. Badgers are having a difficult time finding their open shooters. Gophers finally take @jsuthHN’s advice and get it to Mbakwe who gets fouled. He misses one of two. Just. Ugly. Thanks for doing the math. Ick! 3:40: @BrandonHarrison “Mbakwe the difference for #Gophers so far in 2H: 8 pts, 10 reb. now. RT @JimPolzinMSJ: Mbakwe with 4 offensive rebounds in the 2nd half. Mbakwe grabs a big offensive board because Tubby — if you are not going to draw up plays for him, he will get it himself — and then makes a big baby hook over Berggren. Gophers up 2. They have the fans right where they want them. Here comes the FG drought. Not exactly inspiring. Even after an Evans TO, Badger fans have to feel good about their chances to close this thing out. Those numbers are downright scary. And, right in line with the above stat, Gophers turn the ball over on a shot clock violation. Absolutely no rhythm to this offense. Okay, so some context. Evans makes his 9th big flub of the 2nd half, missing his first FT. In fact, he only tickles the front of the iron. He then misses his second (hence vikingsrube’s advice: box out). Gophers do box out and draw a foul. Ingram promptly misses the first. The Badgers come back down the floor and tie it up. Was there any doubt? Quick, a fan of which team Tweeted the above?? I am not sure either. But, since it came shortly after Dre took an ill-advised drive to the hoop. Great acting job by Brush on the charge. Badgers win on a shot after the shot-clock expires. Gophers didn’t deserve it anyways. Say no more @reporterbw!! Jim Jackson, Jr. (4 for his last 17) hits a pull-up jumper as Mbakwe flies by to put the Badgers up 2. I would say soul-crushing about does it. Even more so considering the replay looks like Jackson did not get the ball off in time. Only a Minnesota sports team could find a way to lose like this. One last chance. Let’s explain this. So, the ball is inbounded and Mbakwe makes a great play catching it with one hand, turning, and nailing the fadeaway that would have tied the game. Instead, as he is doing that, he is fouled by Brusewitz. Wisconsin is initially angry. But wait, Mbakwe is hurt. He cannot shoot the FTs. That means the Badgers get to pick who gets to shoot the FTs. Not good for Gophers fans. Mbakwe makes the shot that would tie it, and instead, the Gophers get to watch Rodney Williams try to make two FTs. He misses the second. Your season in a nutshell. This entry was posted in Badgers v. Gophers, Home and tagged Austin Hollins, Badgers Gophers, Border Battle, Gophers basketball, Gophers basketball ranking, Gophers losing streak, Minnesota basketball, Shot clock violation, Trevor Mbakwe, Tubby Smith fired, Wisconsin Basketball. Bookmark the permalink.